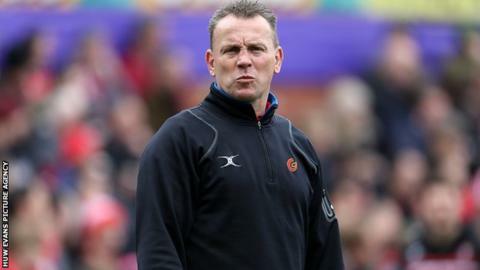 Newport Gwent Dragons head coach Kingsley Jones says European Challenge Cup semi-final opponents Montpellier are "a top side, but not unbeatable." The Dragons won 23-21 at Gloucester to earn their last four place and will travel to the Altrad Stadium on Saturday, 23 April, kick-off 18:30 BST. Montpellier qualified from their group despite losing away to both Cardiff Blues and Harlequins. "The Blues pushed them all the way a couple of months ago," said Jones. The Welsh region who included four South Africans in their side at Gloucester, will be up against a side with a massive South African influence when they travel to France. Montpellier won 25-19 in their quarter-final away to Sale Sharks, who topped the Dragons' pool. The French club are headed by former national coach Jake White with their quarter-final team including international front-rowers Bismarck and Jannie Du Plessis, plus utility back Francois Steyn. "Bismarck du Plessis is playing particularly well and their physicality is evident," Jones told BBC Wales Sport. "Twenty-five million their budget isn't it? It's a little bit different (to ours). "Montpellier are an excellent side, but they've had a couple of shockers at home and some big wins away. "They're a top side, but not unbeatable. Last year we did the double over Stade Francais, who won the Top 14." Montpellier were promoted to the Top 14 in 2003 and won the third-tier European Shield in 2004, but are relative newcomers to the top half of the French top flight. "We haven't got to many semi-finals in the first place so to host one in your own town and have your own supporters there is going to be massive," said White. Montpellier's quarter-final team was led by France flanker Fulgence Ouedraogo, while fly-half Francois Trinh-Duc is also on their books. Dragons reached the semi-final in 2015 only to lose heavily in Edinburgh. "I think it's a real achievement for the region (to get there again) and we deserve some credit, but can we go one better? We all know if we get to the final, them anything can happen," said Jones.